Consistency is one of the key areas you should look at when considering betting on horses. We can almost instantly assess if a race horse is consistent or not by briefly looking at its race history. For example in the screen shot below I have highlighted the key areas you need to pay attention to. 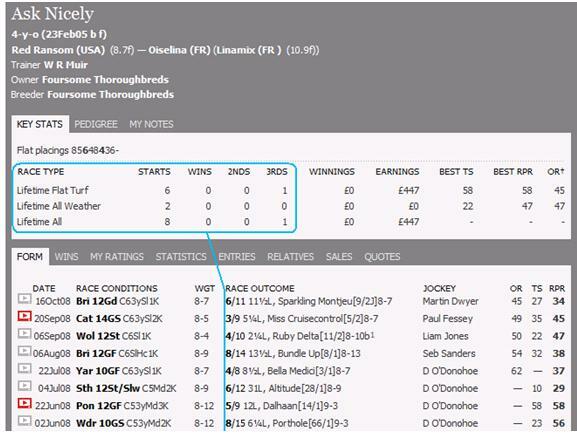 To swiftly assess a horse’s overall consistency look at the Starts, Wins, 2nds and 3rds columns. Also looking at the race outcome column will contextualize any wins or places in a time frame. From this we can often see that a horse is either coming in form, or going out of form. In “Ask Nicely`s” case, the horse looked pretty mediocre –At the time this shot was taken its last 6 races in descending order read – 6, 3, 4, 8, 4, 6. A pretty poor race horse in conclusion. Some horses start off favourite for a race simply because they won their last race, or they face mediocre opposition. However, delving into a horse’s form record often reveals they don’t win very often which means that they are on the whole inconsistent. Serious backers would place little faith in these types, and they are often worth opposing when the right factors can be identified. Briefly look through a horse’s race history and make a mental note of how consistent it is. If you can only find one or two wins scattered in between moderate to poor performances, then the horse is at best mediocre and opposable. Refer to “last time out winners” See if you can identify whether the horse has won 2 consecutive races before? Lower class horses usually fit this kind of profile, i.e. the odd win scattered amongst poor performances. 3. Does the horse place regularly, but rarely win? Check how far a horse was beaten in it s last few races. If it was more than a good few lengths then the place form may be useless. Certain horses finish annoyingly 2nd or 3rd numerous times. These types rarely win and make very good lay selections under the right circumstances. Sometimes there are valid reasons why a horse only manages to make the first 3 in numerous races, such as it has come across one or two progressive sorts (Improving horses) Often you will find its an issue of temperament and basically the horse doesn’t like to be challenged and when it is folds tamely. If you would like to learn more about form reading and betting on horse racing. Download our FREE “Ultimate Guide To The Racingpost.com” NOW!